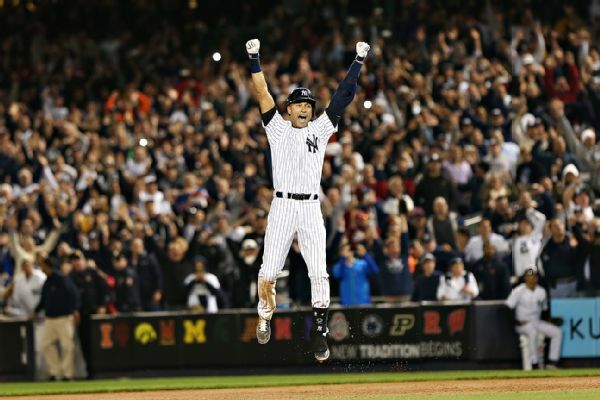 Major League Baseball’s online streaming service set a viewing record for a single game last night with the New York Yankees captain’s final game in pinstripes — where, in a moment almost too dramatically perfect to believe, he drove in the game-winning run. Fans accessed 641,000 streams, beating by 18% the previous one-game regular-season record set on this year’s opening day, March 31. Viewing peaked just before 10:20 PM ET when Derek Jeter hit his single to right and touched off the Yankees’ on-field celebration. The streaming figure for Jeter is especially impressive because it doesn’t include any viewers in New York or Baltimore; MLB.TV subscribers only get to watch out-of-market games, so it doesn’t compete with local broadcast or cable telecasts. Los Angeles, Philadelphia, and Boston were the top markets for last night’s game. The only baseball event that topped last night was the Home Run Derby that took place the day before the All-Star Game in July. That attracted about 800,000 streams — but had the advantage of being available in all markets. Fans clearly were cued in to the end of Jeter’s nearly 20-year career. In the past 24 hours they watched more than 15 million Jeter-related clips on MLB.com. The vast majority of MLB.TV subscribers pay $129.99 for a full season, which they can access via Apple and Android-powered devices, as well as all of the major gaming consoles and smart TVs. It didn’t hurt, of course, that it was a most improbable ending to Derek Jeter‘s career at Yankee Stadium and, at the same time, utterly predictable: ninth inning, runner on second, game on the line and the player who has been called “Captain Clutch” at the plate. As he has done so many times over the past two decades, Jeter jumped on a first-pitch fastball and with that instantly recognizable inside-out swing slapped the ball hard on the ground into right field to score the winning run in a dramatic 6-5 New York Yankees victory over the Baltimore Orioles. Yankee Stadium, which had overflowed with love for Jeter all night, erupted in the kinds of cheers reserved for the greats of Yankees history. Two innings earlier, it appeared Jeter had won the game in less spectacular fashion, with a bases-loaded bouncer that broke a 2-all tie when Orioles shortstop J.J. Hardy fired the potential inning-ending double-play ball into right field for a two-run error. And Jeter had started off by thrilling the crowd with a first-inning RBI double that narrowly missed being a game-tying two-run home run, hitting the left-field fence about 3 feet from the top. But it seemed the night was headed for a dispiriting end when Yankees closer David Robertsonblew a three-run lead, allowing ninth-inning home runs to Adam Jones and Steve Pearce to draw the Orioles into a 5-all tie. All Robertson had done, however, was set up Jeter for yet another memorable moment in a career that has been filled with them. After designated hitter Jose Pirela led off the bottom of the ninth with a single and Brett Gardner bunted him to second, Jeter came up against right-handed reliever Evan Meek. One pitch later, the ball was rolling into right field and Jeter was being swarmed on the field by his teammates, having come through in another clutch situation. It was a moment so electrifying that even the victimized Meek had no choice but to savor it. Meek said that as Jeter came off the field, he said to the Orioles’ bench, “Congratulations and good luck. You guys deserve it,” referring to the fact that Baltimore finished atop the American League East, a position the Yankees occupied at the end of 13 of Jeter’s 20 seasons. The normally stoic Jeter was swollen-eyed in his postgame news conference, and admitted it took effort to control his emotions throughout the day and that he had broken down several times during the game. Jeter said there were times during the game when he was so nervous he hoped the ball would not be hit to him. In fact, he made a throwing error the first time he handled the ball. Over the past week or so, Jeter certainly has looked like a player with a lot more baseball left in him. In the eight games of the Yankees’ final homestand, which concluded with Thursday night’s victory, the 40-year-old Jeter had 12 hits in 34 at-bats (.353) and nine RBIs. Jeter said he would not play shortstop in the Yankees’ final three games at Fenway Park this weekend, preferring to have played his last game at the only position he has played in 20 big league seasons at Yankee Stadium, but would like to be the designated hitter in at least two of the games.